Ben King and Roman Kreuziger bat their responses back and forth, as if they were following a well-rehearsed script, but these are lines that come with subtle changes at every race and actors that rehearse their performances in their heads on every training ride. Each time leads up to this very moment: race day. They’re in the dressing room now, but the Team Dimension Data bus doesn’t have any bare bulbs lining the mirrors and the team’s a little less rock’n’roll–with more energy bars and electrolytes than you’d normally find in the fare backstage at a major concert. Chat about kit continues to whirr around the bus. Recent editions of the Strade Bianche have not been easy on the riders. The race’s Tuscan coordinates on the map might lead them to think that they would only ever need to put short-sleeve jerseys and shorts in their luggage, but its positioning in early March has refuted this presumption, year upon year, with drama that has made it many people’s favourite race already. Gino Mäder, first year pro for Dimension Data and first timer at Strade Bianche, doesn’t yet know if it will become his favourite race, but with his aim of becoming ‘a solid all-rounder’, you can presume it will be high on his list of dream victories one day. 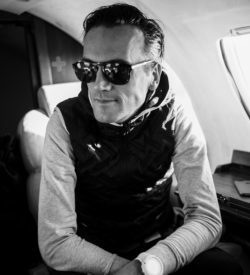 He briefly stunned his co-actors on the bus by revealing that he was going ‘baselayer-less’, arguing that it ‘felt racier.’ The responses from the more veteran riders were mixed, and Kreuziger’s more wizened approach to the ASSOS Layering System demonstrated a shrewdness to layering that he’d honed over the years. Today’s challenge felt almost too easy though, as Toscana was in full bloom, with spring-like conditions bringing sun and mild temperatures for the peloton. However, this meant there would be copious amounts of dust as a by-product. It would be a race fought in a cloud to the point where their eyes and lungs were sore, as everything was left shrouded in a layer of fine dirt from the white roads. As we sat in the team’s mobile locker room, the riders were notably fresh and free of dust, kicking back amongst the sort of calm that comes before a storm. Intimate access had been granted to us through the team’s technical apparel supplier, ASSOS of Switzerland, and they were on site with apparel technicians to get crucial feedback from the riders. Discussion had taken a turn from clothing to a more light-hearted debate about Kreuziger’s permanent tan, which stood out against the unspoilt black of his S9 shorts and bright white jersey, and the stories behind certain scars, a welcome distraction from pre-race nerves. We left the bus before the athletes headed to the start. Our ride was fixed with two of the team’s zone hoppers, who–according to the stage directions–had to hop into action in the fourth, sixth and tenth sectors of the race. The severity of Strade Bianche can only truly be comprehended when you ride the course, but you get quite a good impression by car too. Taking place in what some people call the Italy’s Ardennes region, the constant ups and downs make for a leg-breaking route. Mix in the often lengthy sectors of loose and rutted-out gravel that swerve over the area’s contour lines and you soon understand how the race has become an iconic early-season stop on the WorldTour. Bottles and spare wheels readied, we diligently worked through our scheduled stops for the day. It was a case of hastily trying to piece together the race situation as the peloton buzzed by. We only had snippets of the story, not even half of it in fact, as we headed back to the team bus to wait for the arrival of the riders. Inside the sanctuary of the bus, the chaos and dust of the race felt ever so far away. The local coverage filled us in on the drama, and we got an early debrief as Gino Mäder re-entered the bus before the end of the race. Our big-screen live coverage ended then, as the bus returned to its locker-room form. He had climbed off after the eighth sector of gravel, dropped from the race, missing some top-end form after a five-week break from racing. His face, etched with disappointment, was arched towards Alex Sans Vega, one of the team’s directeur sportifs, as if he were willing him to have an answer. Gino was consoled by the fact that the best of the best were there, on their best form for the best spring races. That sort of jubilation–even without a win–is what cycling is all about. And maybe road riding needed something extra; perhaps it is precisely this that might have been lacking recently. The addition of new surfaces, predominantly gravel, could be what’s now keeping pro racing fresh, because it brings out the kid in all of us–pros and amateurs alike. And even though the weather did not have a starring role, even ASSOS can accept that some days it is great to just switch off and ride, leaving thoughts of what to wear behind. From the Le Houdini to the S9 shorts, the Liberty rain jersey and the essential skinFoil baselayers, there are certain characters that don’t need much screentime for us to recognise their importance. Go to ASSOS.COM to meet the rest of the cast. Part 3 of our insider look at the partnership between ASSOS of Switzerland and Team Dimension Data.